This is a new Military stamp that my husband recently purchased for me at the ARMY post Fort Lewis, WA. 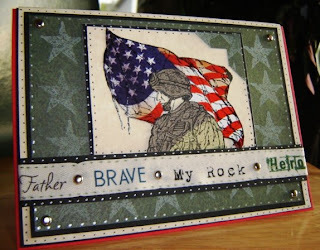 I am proud to be using this stamp for cards honoring our troops serving. Im not sure who the maker is, but its a local artist/illustrator. It's a perfect image of an ARMY Stryker. If you are part of an active duty family like us or have a loved one in the military, you will recognize this armored vehicle. The ARMY Stryker is the combat vehicle of choice during conflict. It combines firepower, battlefield mobility, survivability and versatility. 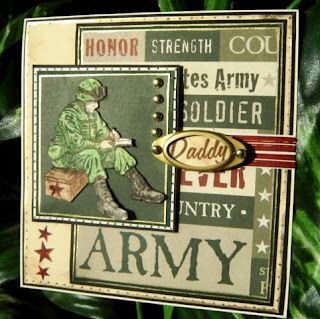 Next is a house stamp I used to go with this ARMY sentiment.... I had it on SCS, but I decided to move it here instead.... This sentiment is by the same local artist. 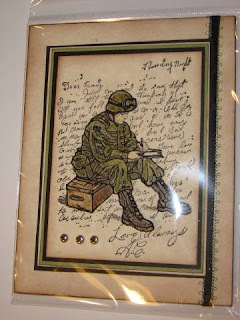 (I would really love to meet this artist person as I have some ideas for more military stamps). 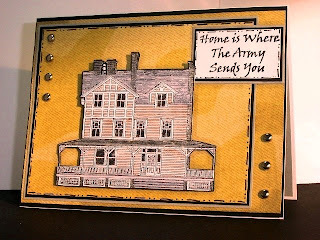 :) The sentiment "HOME IS WHERE THE ARMY SENDS YOU"... has such great meaning! Ya know..... your new DUTY assignments really truly become your new HOME. While the process can be stressful, it actually really is quite exciting. Moving around the globe gives you and your family diversity and wonderful opportunities to experience living in different places that you would otherwise not have thought about!! This Large House was stamped twice. Once on the DP and another on white CS. It was then colored in and cut out. The 2nd house was layered over the first with foam adhesives for added dimension. This gorgeous EAGLE isnt a stamp. Its an enhanced sticker from a set of Miss Elizabeth's Collection called USA Hurray. Its already beautiful but I wanted to enhance it to showcase it better so I stuck it onto vanilla cardstock and cut around its image lining. Then colored it in, inked the eagles body and the eagles edges over an dover then outlined the body's feather lines with Marvy Leplume Markers. This card was one of my favorites... The image is from the SU set that I LOVE.... called "GODSPEED" and the BG DP are 2 sheets from a 6x6 Military DP stack. Wow your Military cards are so wonderful, excellent job. Thanks so much for dropping my my blog, I love your work tooo. America - what an awesome tribute to our military!! These are all awesome!! Maybe you could just add a military tag to all your posts with military cards so they can be easily found? The stryker and "home is..." stamps are great! I've never seen those before! And how true that statement is! It's funny how we get the itch to pick up and move every few years - even my kids look forward to what the next move will bring. I am amazed at how much of the world I've been able to see and experience through the Army! Bless you and your family for serving!! Hoooah! 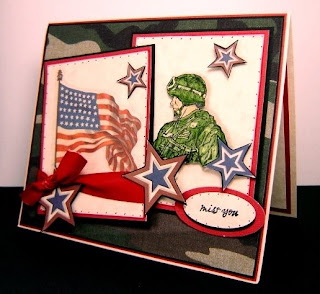 I love your military cards. Our son inlaw is in the Marines so I can appreciate what you're doing. How cool that you gave away the cards to those who shared their stories. What an encouragement, to them and to you! 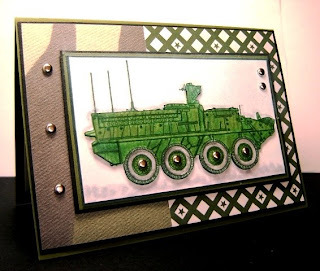 Amazing work, these military theme cards are stunning! My son has just recently returned from his third tour in Iraq. 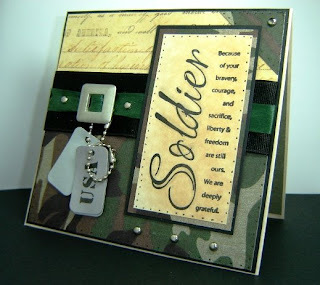 I was really thrilled with your Military cards.. they are so true and are packed with strong emotion. My heart aches for all the families that this war has touched and will continue to touch. Where can I find some of the stamps that you used... you mentioned your husband found some on the base. I thank you for your time, and celebrate your wonderful talent.. your cards are GREAT! !